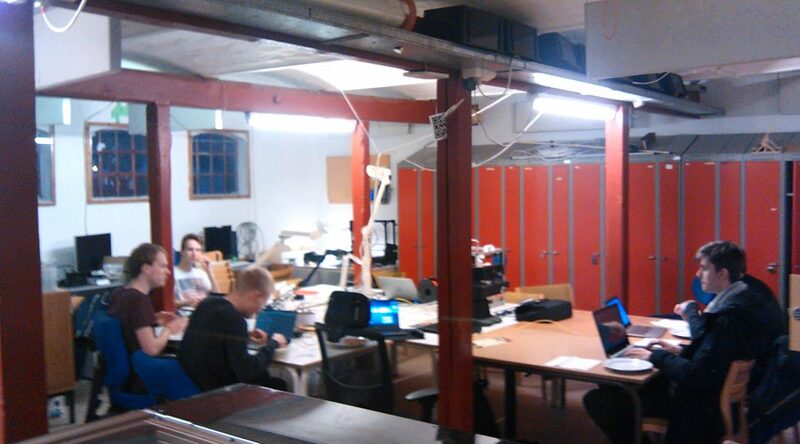 Last Wednesday was no less than the third time the local FOSS group in Aalborg met. Today I’m looking back at how it all started so I thought I would share some thoughts that may help others who would like to spread free and open source software in their local area. ..whether it means collecting e-mail adresses or creating a group on social media. In my case I resorted to creating a public group on Facebook called “Open Source Aalborg”. You’ll need some way to get in touch with others who live in your area and is interested in this topic. In my case I happened to get in touch with my local IT union PROSA who helped arranging a free event called “IT X: Open Source” and reaching out to many members locally (in particular students). Note that the extensive use of “Open Source” rather than “Free Software” was simply because the term is less ambiguous and more familiar (ie used more in media) to people. IT X was a great springboard to do this. IT X was arranged as a talk show. First talk would explain to the audience what open source was, since the audience might be familiar with the term at different levels or not at all. Secondly we ran talks on how open source is useful. For me that meant giving a talk at IT X where I talked about how and why I spend my free time contributing to GNOME. The audience was primarily students and software developers so I designed my talk to largely concern how open source can benefit your skills and experience with large-scale collaborative software development. At the end of my talked I promoted my local initiative “Open Source Aalborg” and afterwards Hal9K also promoted their local hackerspace which also is located in Aalborg. The next days after IT X, Open Source Aalborg expanded from 6-7 members to 40 members. I followed up by making the first “Open Source Night” 14 days after the talk show had happened. Looking back I should probably have made the first event even 7 days after. When scheduling I tried making it as convenient for people as possible. We would met on a Wednesday at Hal9k from 5 o clock (after work/university) to whenever people wanted. To make it further convenient for attendees we arranged pizza so attendees wouldn’t need to concern themselves about food either. Sightseeing in the local hackerspace. Talked about each other’s individual interests and areas of expertises. Discussed various news and upcoming conferences that we knew of. For the following meetings I usually picked up what was previously discussed or coded on and used it to write a description that teases the possible topics we might discuss at the next meetup. It makes for a nice motivation I think, plus we keep each other up to date on how we are progressing. Another fun thing we have done is that last meeting I arranged a video conference call with Johan Thelin from FOSS GBG. We talked with Johan about the history behind the Gothenburg FOSS group, how they run their meetups and about their upcoming conference foss-north. The video conference was definitely a success – we even talked about making a video conference meeting between two FOSS groups sometime. What I particularly like about doing this, is that it gives a taste of the impression that this little local group is part of huge worldwide community. This is a feeling which I think can really benefit the motivation among individuals in any local FOSS group out there. Send and receive greetings with other FOSS groups. Have video calls with members of GNOME or someone experienced in open source could be insightful. Arrange a follow-up talk event on open source in the fall where members can do lighting talks on the small projects they have worked on throughout the year. Find local companies or initiatives related to open source and have them come around and present what they are all about. Go on a trip to a FOSS conference together. Are you in a local FOSS group? Trying to get one started? Let me know! I’d be more than happy to listen to your suggestions too. Press the picture to watch the video on Youtube or download it here. A crude approximation of my time distribution while working on the GNOME 3.20 release video. Doing those videos is some work. Since my GSoC internship on Polari, my motivation has shifted heavily towards the realms of interaction design and involving new contributors to GNOME in general. That and a want to create videos beyond just during every release has encouraged me to look into creating release videos more effectively. Yet despite that mindset I’m still very satisfied with the outcome and I feel I have evolved yet again from last cycle’s video. The final release video as edited in Blender VSE. By animating empties rather than the objects themselves, I’ve managed to create a collection of animations I can reuse at any point in the future. Not only does this save me time, it also means that objects in two different scenes can share animation and have consistent timing. As an experiment I played with adding camera imperfections to the video such as grain, slight vignette and dispersion. The aim here is to let the virtual camera feel more “real” – adding to the perceived quality (it’s something that we subconsciously expect). If everything went well, hopefully these effects should have gone unnoticeable through. It is definitely something I want to study further. Last semester I had a course in Screen Media, which introduced much useful film theory to me. For the GNOME 3.20 release video in particular I’ve been more aware of the rhythmic relation between the music and the editing. Cuts and animations are timed to the pace of the music giving the video a more natural feel. I also had the chance to play with the use of ambient sound – you may have noticed the sound of an ocean in the background. The purpose of the ambient sound is together with the picture to cue the viewer of a location, season and time of day. I thought the ocean would be a fitting choice with the music to put the viewer in a calm mood. 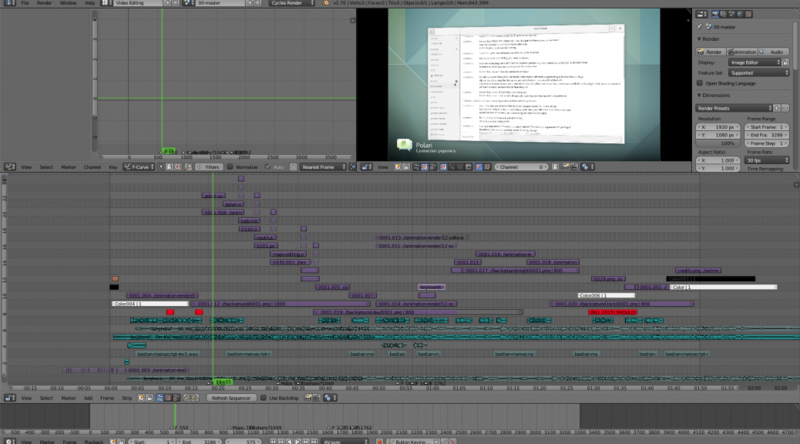 Kudos to the team behind Blender for such a powerful tool I can use in my Free Software pipeline. Same goes to GIMP, Inkscape and ffmpeg. I have Karen Sandler and Mike Tarantino to thank for providing such a professional voice-over. Good sound has incredible influence on the perceived video quality. With help from Petr Kovar and the GNOME Translation Team the video is also avaiable in 13 different languages. The Engagement Team gave feedback and coordinated the release. The GNOME Design Team has made the vast amount of visual assets that I use. Finally, a big pad on the back to all the developers and contributors in GNOME! Every cycle we advance free desktop technology further and that’s an important message to send to the world. Serphonic for his single “On the Way” which was the background music in this video. Cheeseheadburger for his “White Sands Footsteps” sfx. JarredGibb for his “Sub Rush 1” sfx. gnrja for his “ocean waves” sfx. 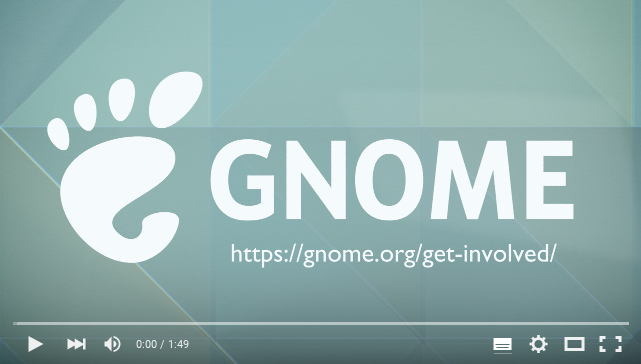 The GNOME 3.20 release video is licensed under CC-BY-SA 3.0 and can be downloaded here. The source .blend file can be downloaded here. To keep the file size down I’m not including any animation assets.